Amajuba District Municipality is situated in the north western corner of KwaZulu-Natal. The district's local municipalities consist of Dannhauser, Newcastle, and eMadlangeni. The N11 which runs in a north-south direction linking the KwaZulu-Natal with Mpumalanga Province serves as the primary corridor and main access route to the district. Newcastle town is the main urban centre and economic hub; towns such as Dannhauser and Utrecht serve as secondary service centres with limited thresholds. Amajuba is positioned within a region that is rich in terms of natural resources which includes Ncandu and Chelmsford Reserves at the foothills of the Drakensberg. The district is predominantly rural and dominated by extensive commercial farmlands mainly in the form of livestock (cattle) farming. The area is also characterised by massive poverty, service backlogs and areas with marginal production potential. The latter coincides with areas occupied by the majority and previously disadvantaged rural communities or villages. The Amajuba District Municipality supports individual and community programmes relating to the development and rights of women and directs them to benefit the area. Programmes which are explicitly designed to promote employment and income generation for women are stressed. 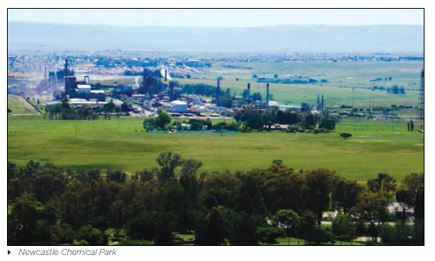 Newcastle Local Municipality is classified as a secondary node, which is an urban centre with good existing economic development and growth potential, and which services the regional economy. The municipality prides itself on the achievements that have been made in the past 20 years, successful projects include: eco parks and an outdoor gym, the Clifford Manana Bridge (Asiphephe), Kwa-Mathukuza housing projects, and the eTheku mall. Dannhauser Local Municipality is the smallest municipality within the district and is named after an old farming family that lived in the area. Dannhauser functions as a small rural service centre (providing commercial and service facilities and agricultural industries and services) and is not a large employment generator. Residents of the municipal area rely on the larger urban centres of Dundee and Newcastle for employment opportunities and higher order goods and services. eMadlangeni Local Municipality consists of a vast rural area when compared to other municipalities in the district. The municipality has a low percentage of economic activity. The town of Utrecht, nestling in the foothills of Balele Mountain is unique in that it lies within the confines of the Balele Community Game Park and the Utrecht Community Game Farm. Therefore, it is not unusual to find animals frequenting the outskirts of the town, parks and garden. This initiative by the local town council in conjunction with Balele Conservancy and motivated by individual residents in the district, has brought about a shift in the town's focus from industry to tourism. eMadlangeni is the most important wool-producing area in KwaZulu-Natal. Arts and Craft centre and the battlefields where the Boer, British and Zulu battles took place. The three urban centres of Newcastle, Utrecht and Dannhauser have a good mix of Voortrekker, colonial and eastern structures. Efforts are under way by Amafa KwaZulu-Natal to list and protect the architectural resources in Amajuba. Outdoor adventures: 4x4 trails, white water rafting and kayaking, abseiling, gliding and micro-lighting, quad bikes, horse riding. Specific events such as festivals and sporting competitions. Amajuba will be a leading and pioneering District characterised by sustainable development and quality services. Vibrant Local Economic Development - Integrated Service Delivery.